Last weekend I had the pleasure of attending the Oslo Objectivist Conference 2012 in Oslo, Norway in which I enjoyed a weekend of Philosophy, Objectivity and a celebration of Individual Rights. On Monday before returning to my base in Leipzig, I decided to spend the day enjoying the parks and streets of the city (one of my favorites) and during lunch I went to eat buffalo wings in front of the City Hall Park. That noon I was reading the last pages of the book “How Capitalism Saved America” by Thomas DiLorenzo and was writing extensive notes in my notebook criticizing many of his arguments in favor of capitalism due to lack of consistency and integration. Leaving those morality issues aside, I was very interested in his historical explanation on the role that Unions (and privileged groups of interest) have had in destroying the foundations (principles) of capitalism in the United States since the foundation of the country. Curiously, that same day the Farmers Union of Norway gathered in front of the park to do a countrywide protest (news). As DiLorenzo writes, Unions have claimed for decades to be representatives of the “interests” of society, workers, middle class, proletarians and et. al. However, it has been actually only in the interests of the Union’s leadership and their pursuit of cronyism that they have actually worked by being concerned only in “their own membership rolls and dues revenues”. Examples from the Unions intervention in the destruction of the most successful industries of the United States are explained by DiLorenzo’s book. On Monday, the disgruntled Norwegian farmers decided to take the streets against the recent decisions of the government in April, 2012 to subsidy of Agriculture by granting only 625 million Norwegian Kroner instead of the 2.2 billion they asked. 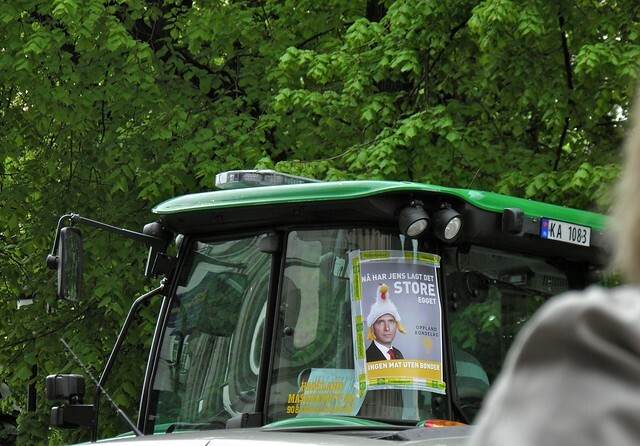 The Norwegian Farmers’ Union (NFU) decided to take their trucks and cows and occupy the doors of the City Hall in Oslo; in other cities and towns the mayors were even kidnapped by the unionists. This protest arise after the Parliament decided that that food prices should rise 20 percent in the next 20 years in line with expected population growth, providing sufficient income to both achieve this and ensure continued recruitment to farming (this reminds me of Hayek’s ideas on the Fatal Conceit). The NFU doesn’t agree. They consider that the average annual incomes are under 300,000 kroner per man-labour year, whilst it is 469,000 on average in other sectors. They also claim to represent the “interests” of 100,000 jobs in agriculture and food industry and not only to be seeking for more money for farmers (yeah, right). Norway is one of the richest countries in the world and its society lives in very comfortable conditions. The Leviathan in government charges immense amounts of taxes and inflation is incredible. Just to illustrate the size of Leviathan: The buffalo wings and a beer cost me the high price of 250 krone (aprox. 33 euro or US$41.00 in T.G.I. Friday’s) That same meal would have cost me much less if bought in the U.S. or anywhere else in the world . How can they afford it? The population earns artificial higher incomes due to the government interventions in the economy and disrupts the economy of the country. How did the country reached such a condition can only be understood by taking a close and detailed attention to the role interventionism has in a country’s economy. The effect: high prices, unstoppable high taxes and widespread limitation of liberties behind the power that Unions, groups of interests, politicians and bureacrats have had in the economy for decades. Slowly but consistently, the Unions and crony capitalists in the bureaucracy of the Norwegian country have made it impossible to be free to exchange products in the country without any type of government intervention. While Norwegians seem to be free, their daily lives are unconsciously been managed and controlled by a gigantic government that regulated every instant of their lives. I would love to go back to Oslo and if possibilities arise to settle and live there for a couple years. I wish that my passion for buffalo wings will bring me to experience a story to write about and meditate again. As for now, I return to write about Capitalism while sitting in a desk in Leipzig, Germany.